We specialize in the oncidiinae intergenric plants. We have orchid plugs to allow you to grow finished plants. We also offer blooming and blooming size plants in 3.5" pots from our breeding and evaluation stock.^^We also offer species and hard to find plants. Please call for weekly lists. You will find an answer to your every need whether they be large quantities or small, young plants or flowering, or unusual and extremely exotic. We specialize in potted Intergeneric Oncidiniae, Paphiopedilum, Phragmipedium, Zygopetalum, Dendrobium species, Cattleya species and hybrids, Cymbidium, Cymbidiella, and Phaius orchid plants for the wholesale and retail markets. 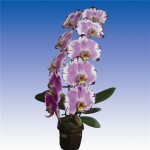 We offer an extensive collection of orchids year round.